1) Fresh Mutton – 750 gms. 4) Vinegar – 2 teaspoon. 5) Turmeric powder – ½ teaspoon. 6) Red chilly Powder ( Kashmiri) – 1 table spoon. 7) Coriander powder – 2 table spoon. Fresh crushed Pepper powder – ¾ Table spoon. 10) Water – ½ cup. 12) Green chilly – 2 nos. 15) Oil – 2-3 table spoon. 16) Mustard seeds- 2 teaspoon. 17) Curry leaves – As required. Marinate the mutton with 2-9 ingredients and keep aside for about 30 minutes. Then pressure cook with ½ cup of water for about 6- 7 whistles. Heat oil in a thick bottom pan, pop up mustard seeds add green chilly& shallots then sauté until it becomes transparent. Then add chopped tomatoes and sauté until it cooked. Then add cooked mutton, and garam Masala powder, mix all ingredients well and do a taste test and adjust the salt (if you want) and cook the mutton again for few minutes until the gravy start to thicken and put some curry leaves over it and switch off the stove . 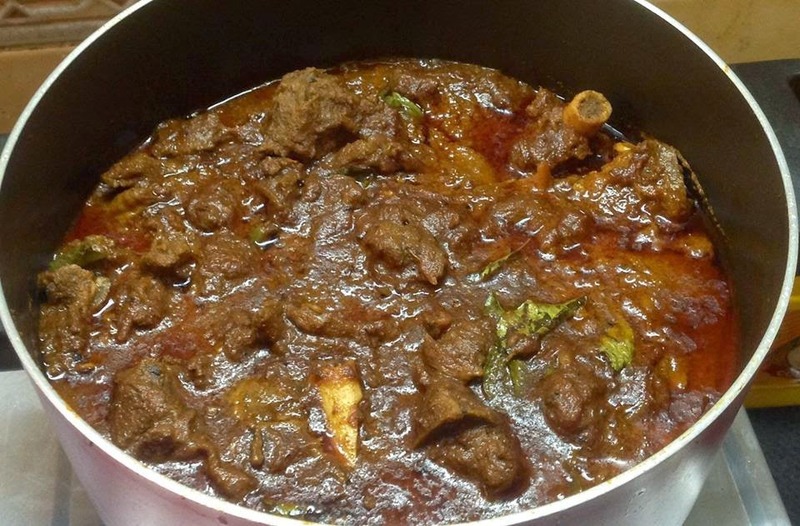 Your Mutton Curry is ready to serve.